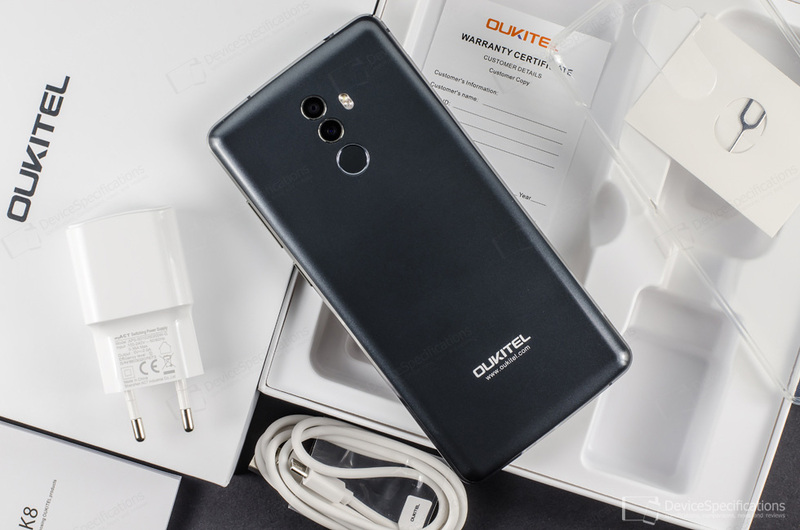 Oukitel K8 is the latest Oukitel smartphone and its most prominent feature is the big 5000 mAh battery, which should provide more than average battery life. The device is suitable for everyone who needs a long-lasting-battery smartphone - frequent travellers, long-distance drivers, people who need to call or receive calls frequently, and at the same time does not want to spend a lot of money on such a device. 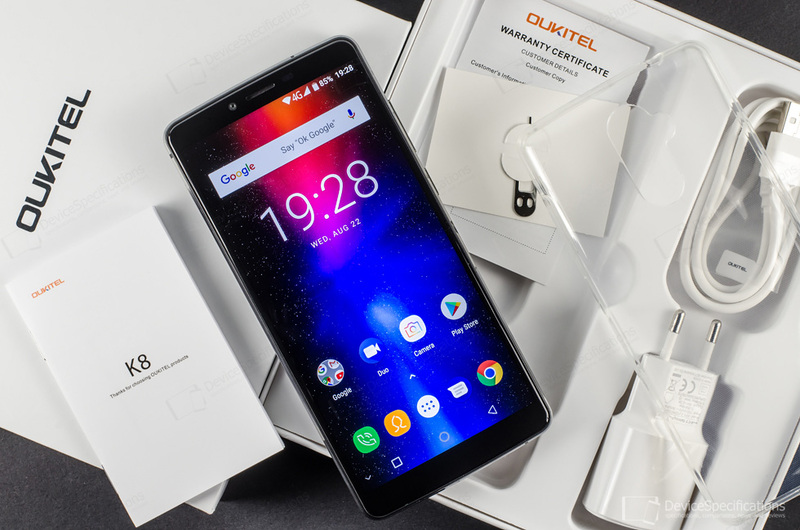 Priced at around USD 160, Oukitel K8 does have an incredibly low price for a smartphone with a 5000 mAh battery, 6-inch FHD+ display, MediaTek MT6750T chipset, 4GB of RAM, 64GB of storage, dual rear cameras, and Android 8.0 Oreo. Here's our in-depth review of the model, which will answer with precision all or at least most of the questions you might have about K8. As usual, we do the measurements, you do the conclusions. Oukitel K8 is built around a 6-inch in-cell IPS display from AUO. The panel has an FHD+ resolution (1080 x 2160 pixels), an 18:9 aspect ratio, and is protected by a 2.5D curved Asahi Dragontrail glass. The back of the device is covered with a plastic hood with a metallic texture while the frame is made of zinc alloy. Under the hood, there's a high-density 5000 mAh battery paired with a 5V/2A fast charger. Performance relies on a MediaTek MT6750T that includes an octa-core Cortex-A53 CPU with four 1.5GHz cores and four 1GHz ones. The processor is combined with a dual-core 650MHz Mali-T860 MP2 GPU. The RAM and storage measure 4GB and 64GB, respectively. The RAM is single-channel, LPDDR3, clocked at 833MHz and the internal memory can be expanded with up to 256GB. The camera department includes a 5MP front camera with a GalaxyCore GC5025 sensor and an f/2.8 lens. It supports face unlock. The back is adorned by two shooters. The main one packs a 13MP Sony IMX135 sensor and an f/2.0 lens. The auxiliary one is equipped with a 2-megapixel sensor - most probably a GalaxyCore CG2035/2145 one. They are accompanied by a dual-LED flash and a fingerprint sensor. The device supports 2G GSM (850, 900, 1800, 1900 MHz), 3G W-CDMA (900 MHz, 2100 MHz), and 4G FDD-LTE (800, 900, 1800, 2100, 2600 MHz) networks with Cat. 6 LTE speeds. Bluetooth 4.0, dual-band Wi-Fi 802.11 a/b/g/n, Wi-Fi Direct and Wi-Fi Hotspot are supported as well. The smartphone works with GPS and GLONASS. It is also equipped with a 3.5 mm jack and Micro-USB 2.0 port with OTG support. The device runs on Android 8.0 Oreo.